Lipstick and Lightening: A/W 2013 trends that have caught my eye! Hi guys! Today I will be talking about the trends that have caught my eye for the Autumn and Winter seasons for 2013! As much as I talk about make-up and review beauty products, I actually prefer clothes! I love them, I could spend all my money on clothes, if I had my way. I never, ever follow the ''trends'' though, I have my own specific style, which I love and took quite a while to get right, hey, we've all had those fashion blunders *cough* baby pink ra-ra skirt with wooden wedges *cough* but, nevertheless, I love some of the trends that have appeared for the season, and I thought I'd share my own thoughts! I absolutely adore this trend. Adore. It's my favourite A/W trend. It's so versatile. It mixes leather with softer, feminine clothes, usually soft pink dresses and skirts. Feminine with masculine. Soft with edgy. Perfect. Trends like this are so fun to experiment with. 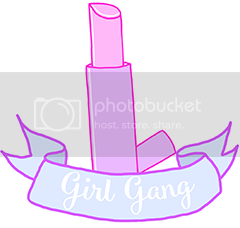 Put together nicely, I think it would look amazing on everyone! I hope to be rocking this style myself in the future. Black and pink seem to be the main colours for this particular trend. Leather jackets, army boots, feminine dresses, skirts, lace, black mesh crop tops, velvet, chiffon, dainty jewellery, some studs and spikes for good measure seem to the main staples for the trend, but honestly I'm a bit sick of studs and spikes as they were SO overdone last year, a bit of a shame since I love studs and spikes, but I absolutely adore this trend. Dusty pink seems to be the celebrated color of the season. And it is a welcome change for those who still want to wear brighter colours during Autumn and Winter, so it's definitely something different! I absolutely hate pink though, but dusty pink and pink suede are the only shades of pink I seem to really like. I love my dark colors though, so I'll be living in three of my favouite colors this Winter, midnight blue, black and burgundy! I'll it in dusty pink in somewhere as it has really grown on me! Watching Xpose yesterday, I saw a gorgeous dusty pink coat you can get in Penny's/Primark for a really reasonable €45! Also, the absolutely fantastic Irish designer Simone Rocha has designed a gorgeous dusty pink coat aswell, which I adore! It costs a very pricey €1'020! It's something different for the usual black and red coats. Leather is everywhere, especially this season, it cannot be avoided, And I love love love it! Leather is timeless, a classic. The leather jacket especially has been around for decades, and shows no signs of stopping! It's the one piece every girl should have in their wardrobe, I know I do, my beloved. 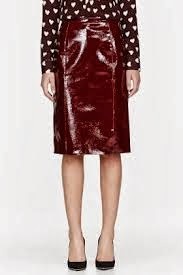 Be it trousers, tops, dresses especially this season, jackets and skirts (have you seen Burberry Prorsum's red leather skirt?!) it's here to stay! The ways you can style it is endless. Some of my favourite ways are with heels, black skinny jeans, a white top and a leather jacket, or over a nice feminine dress, I just love mixing masculine clothes and feminine clothes together! Burburry prorsum's red leather skirt. Tartan is back in a huge way this season. Make no mistake. 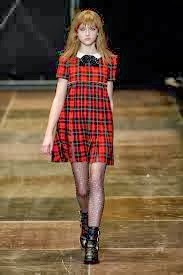 It's not just skinny tartan trousers and tartan skirts, tartan dresses are HUGE at the moment! It's a very brave thing to be able to pull off tartan, very edgy, and has it's own associations with the punk subculture. What may be even braver however, is what tartan is being paired with, leopard print (yikes) leather, so it's a very loud statement piece. Not for the faint hearted ;) I am on the lookout for a nice tartan blazer, so if anyone has seen one for a good price, do let me know. I love this trend, but I would pair it with something a little calmer. I have a gorgeous tartan miniskirt which I would pair with spikey black block heels, a band t-shirt and a beanie (which I am living in at the moment).